With more than 30 years of experience, City Index is a global platform that has been used for forex, CFD and other forms of trading and even spread betting. It has garnered a reputation for enabling fast and reliable execution of trades since it was established in 1983. Based in London, UK, City Index provides traders with access to more than 12,000 markets, which include cryptocurrency, forex, indices, shares and commodities. It is equipped with all the tools that traders might need for improving their skills. It has committed itself to provide transparent and market-leading services, reliable customer support and fair pricing. City Index is regulated and authorized by the Financial Conduct Authority (FCA) in the UK, which means that it follows all its money rules including those of segregating client funds. Moreover, in the unlikely event that City Index has to liquidate, clients will receive compensation under the Financial Services Compensation Scheme (FCSA). Apart from that, accounts that are opened in Australia are regulated and governed by the Australian Securities and Investment Commission (ASIC). The Monetary Authority of Singapore (MAS) regulates and authorizes accounts that are opened in Singapore. With City Index, you can open accounts in Australia, Singapore, the UK and the Middle East and there is a slight difference in accounts for each of these regions. Only Trader and Premium accounts are available for accounts in Australia and Singapore whereas Professional Trader accounts are also available to traders in the Middle East and UK. CFD trading is offered everywhere, but spread betting is only available in the UK. City Index offers demo accounts for spread betting, CFD and joint CFD accounts. They come with £10,000 in virtual money and can be accessed for 12 weeks. While the duration for demo account cannot be extended, traders do have the option of applying for another one if they think they need practice. This account type is only available by invitation. Active retail clients who opt for Premium Trader accounts can get a dedicated relationship manager and enjoy priority service. With this account, you will never lose more money than you have deposited and it offers competitive pricing along with risk management on every trade. Access to webinars, exclusive content, hospitality events, seminars and some powerful research is also provided. Only active traders who maintain a balance of at least £10,000 are eligible for Premium Trader accounts. This account type on City Index is aimed for experienced traders and it gives access to a dedicated relationship manager, broker-assisted dealing and credit facility. Margin rates offered in this account are as low as 0.25 percent, but it should be noted that the losses associated with this account can exceed deposits. City Index offers loyalty rewards to traders with this account like premier hospitality invitations and they can also get extra financial stability due to the credit facility. A quick application form needs to be filled out to become a professional trader. To quality for this account, you need to make an average of 10 transactions every quarter in the last four quarters, have work experience in the financial sector of about a year and have a financial investment portfolio in excess of £500,000. When you sign up on City Index, you will be able to access more than 12,000 CFD and spread bet markets, which include cryptocurrencies, commodities, forex, shares and indices. Clients of City Index have the option of choosing between MetaTrader 4, applications for Android and iOS, Advantage Web and AT Pro. The option of Web Trader is also available to those who sign up in the UK. MetaTrader 4 comes with a wide array of impressive features and is available for Windows, Android and iOS. It is one of the most popular trading platforms available due to its feature-rich and intuitive nature. It comes with professional charting, trading signals, and custom indicators and also support for EAs (Expert Advisors). The mobile applications provided by City Index are available for both Android and iOS smartphones and give access to live economic calendar, charts, live streaming prices, live Reuters news feed and secure 24 hour access to your accounts. Some other features of the mobile app include real-time notifications, one-tap dealing through the charts, intelligent trade tickets and price alerts. You will also find support for personalized watchlists and live in-app chats. When trading, it is possible to switch seamlessly between devices and this gives added versatility. WebTrader comes with reliable and fast HTML5 technology, advanced charts, customizable workspaces, custom indicators and intelligent tools. You also get smarter trade tickets, which provide improved risk management options. Some other tools that are available include market analysis from Reuters, real-time margin calculator, the ability to define limits and stops by price or points and switching between workspaces in a single click. Last, but not the least the AT Pro is a desktop platform that appeals to advanced users who are looking for powerful tools for trading. It boasts enhanced speed and efficiency, trading templates and an advanced charting package. The charts have more than 100 indicators and there are also extensive drawing tools. 15 time frames are used by AT Pro, which makes it easy for traders to zoom across or switch. There is a best execution policy on City Index, which means it will attempt to execute a trade as quickly as possible. Moreover, if the price movements are in your favor during processing, the order will be executed by City Index at the improved price. You can get access to a range of order types, go long and short simultaneously or use price improvement technology with City Index. Traders can also use unrealized profits from open positions as margins for new positions thereby maximizing your trading resources. A minimum deposit of at least £100 is recommended by City Index or enough for covering your first trade’s margin. The account on City Index can be funded with debit or credit cards, including both Visa and MasterCard. Other cars include Electron and Maestro or you can also go with bank transfer if you want. You will be able to make free deposits to your City Index account, but credit card provides may deduct a fee for the transaction. You should remember that funds can be deposited in the same currency as your account, but you can link up to three cards with an account. In the case of withdrawals, you should note that they can be returned to the same mode that was used for making the deposit. A minimum withdrawal limit of £50 is applicable or the complete account balance, whichever is lower. In the case of online withdrawals, more than £20,000 cannot be withdrawn in a single transaction. If you want to extend your limits, you will have to get in touch with client management for this purpose. Like with other brokers, City Index uses spreads for making profits rather than commissions. The good thing about City Index is that it is fully transparent about its charges and the list of margins and spreads are divided into CFDs and spread betting and then further by asset type. You can find variable as well as fixed spreads and margins available for retail clients begin at 3.33 percent. Commercially reasonable rates are used for the purpose of currency conversion. If you leave your account on City Index inactive for a year or more, charges of £12 will be deducted every month. A range of trading tools has been provided by City Index for helping clients in making informed trades and boosting their chances of success. These include a portal for fundamental and technical analysis. The latter scans the market for locating chart patterns before informing you about buy and sell opportunities and this saves your time as you don’t have to do your own research. The best buying opportunities are listed first for identifying great trading opportunities. There is a large number of trading signals also available, which can also be quite handy. The charts that are offered by City Index are also quite powerful and they feature the tools you need for running a market analysis and creating a plan. You will come across more than 65 technical indicators and you can conduct trades directly via the chart. The chart also displays your stops, limit orders and positions and these can be adjusted by dragging lines. Extensive drawing tools are also available that can come in handy for drawing things such as trend lines and you can use them for finding key support and resistance levels. Other than the usual tools, City Index goes a step further and provides traders with real-time news, market reports and financial data from Reuters. You can also find a customizable economic calendar on the platform, which has been developed to help traders in understanding market-moving events for coming up with better strategies. Color-coded dots are provided with the economic calendar for low, medium and high volumes and also categories for previous, consensus and actual figures. Expert market analysis is also available from the global research team at City Index, which is extremely useful in identifying information driving the markets. This can come in handy for predicting price movements and enable you to take advantage of opportunities. It is possible to filter out news stories according to author, market, region or topic. A wide range of order types has been provided by City Index to its clients, which has enabled traders to preprogram the price they wish to use for entering or exiting the market. Trades can automatically be closed with stop loss orders, which can be useful for limiting losses when the market is moving in an unfavorable direction. For closing trades at better prices, limit orders are available, which can lead to a profit. With these order types, you can decide to enter the market when it reaches your chosen price level. You can also use One Cancels another (OCO) orders for setting a stop and limit order simultaneously on City Index. This will cancel one order if the other is fulfilled. You can personalize the trade settings on City Index in accordance with your trading style. If you are using the City Index mobile applications for trading purposes, you can use the option of live chat offered in the app and benefit from the convenience. If you are using the website, you can go to the ‘Contact Us’ option provided at the top of the page. This will take you to a page with the phone number and address of City Index and also an email address and phone number for opening your account and other support. At the bottom of the web page, there is also a chat icon that can be used for getting in touch with City Index’s customer support team. As per the guidelines of the Financial Conduct Authority (FCA), the bank accounts are segregated by City Index. This means that the funds that are owned by retail clients are kept separately from the company’s funds and in completely different accounts. This applies to every account on City Index, regardless of when it was opened. Apart from that, the brokerage has also made it quite simple for traders to stay on top of their finances and funding with free and safe deposits and withdrawals. It provides you with a secure funding portal where you can check your funds and submit your deposits and withdrawals. 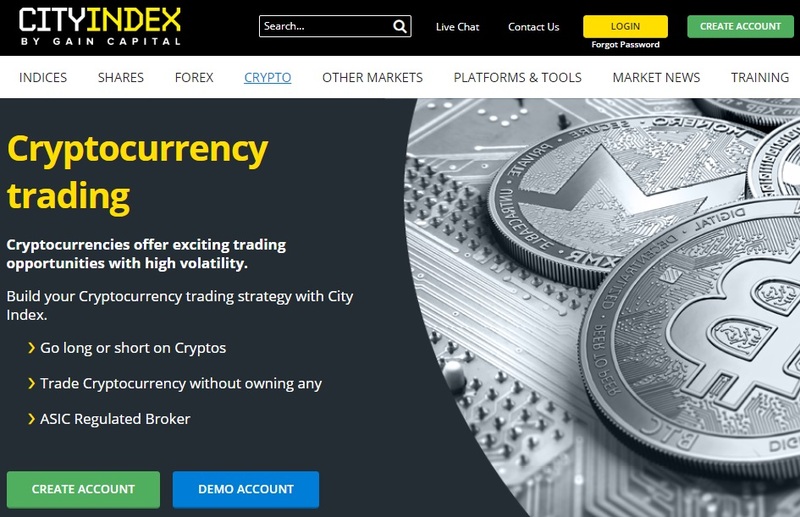 Hence, City Index is a very comprehensive brokerage that offers you access to a variety of markets, which include forex and cryptocurrencies. You can take advantage of a variety of trading tools that are available to make better decisions in the long run. Trade execution is also exceptional and you can sign up for an account suited to your needs. City Index values security and customer satisfaction thereby ensuring you have a positive trading experience.